We've all been dumped at some point in our lives. If you haven't, and you've always been the dumper rather than the dumpee, I don't think you're my kind of person. Those of us who have been the dumpee (or were driven to be the dumper by horrible circumstances), we can probably tell you the story of our most terrible break-up. 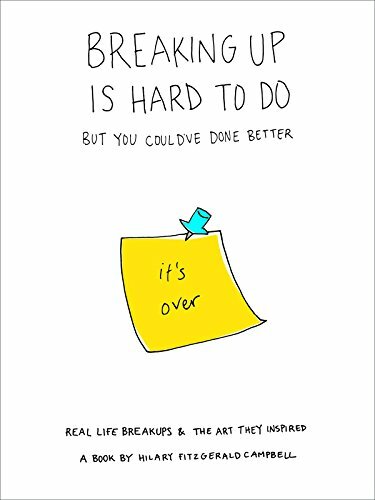 That's what Hilary Fitzgerald Campbell's small illustrated book, Breaking Up Is Hard to Do But You Could Have Done Better, is: short, anonymous tales of break-ups illustrated by basic, quirky cartoons. The stories run the gamut from funny to heartbreaking, from cringe worthy to mean spirited. They are all incredibly brief, some just a few sentences long and some of their emotional weight is lessened by their brevity. Some of the people reporting their break ups come across as a little too pleased with themselves when they are in fact exxposing themselves as jerks. The art work accompanying the stories is simple and often very literal, offering no additional insight into the vignettes. The book did make me reflect on the ends of my own past relationships but mostly they are places I didn't want to revisit. That said, the book is one that works for when you need to be able to pick up and put down your book and when you don't want to think too hard about what you're reading. There are entertaining bits but you'll lose some faith in humanity when you read about how horrible people can be to other people, especially when hearts are on the line, though if you are into schadenfreude, this might be the book for you.